Wind-swept beaches, fantastic restaurants and tax-free living are ideal traits for a low-cost retirement community..
3. Why Are Homes Cheaper in the Country Than Bigger Cities? Finding the right place to spend the final years of your life means choosing communities that have key amenities. Retirement dollars will go further in locales that have low property and income taxes, affordable housing markets, adequate medical resources and lots of local activities. 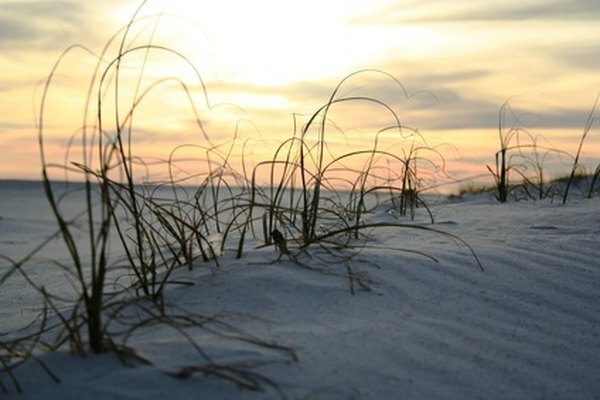 Pensacola's white-sand beaches, easy-going pace and lack of income tax make it a picturesque and affordable place to retire. Beachfront property is still available at reasonable prices, with a community average for housing at about $215,000, as of 2012. It has a fairly active nightlife, a variety of restaurants and a number of recreation opportunities, including 12 local golf courses and quite a few more in surrounding towns. Two major medical centers, Sacred Heart and Baptist, serve the community, as well as a large naval facility that caters to veterans and military retirees. The city also has its own airport, so short hops to surrounding states or connecting with central hubs such as Atlanta is not difficult. Florence is a historic town along the Pacific Coast featuring two bay-front golf courses. Perched on the Siuslaw River, Florence connects with the largest strip of coastal sand dunes in the U.S. Florence sits in a very low-tax region of the country, with about an 11 percent income tax and low local sales taxes. This complements the fact that Florence has a reasonable housing market with an average home coming in at $220,000 -- quite low for any West Coast property near the ocean. Add to that average property taxes of about $1,000 annually, and it's a winning combination for living in a historic coastal town. Near the center of the city, Peace Harbor Hospital is one of several medical facilities available, including the various Peace Health System community medical centers located throughout the area. Probably not on the radar of most retirees, university towns can offer some of the best entertainment and resources available. It's a heavily digital city, with many ways to spend time: unique restaurants in all price ranges, constant musical entertainment with venues accommodating large and small acts, and opera, symphony and ballet companies. Fishing, hunting, hiking and boating are plentiful along a network of scenic waterways within a short driving distance from the city, including Lady Bird Johnson Lake, which runs through the city center. Housing prices are a bit higher than in other areas, with the median falling in at $213,500 and the average house price coming in at $280,000. However, to offset that, Texas is one of the states blessed with no income tax. For those looking for a good hospital, you'll find two major facilities: Seton Medical Center and University Medical Center Breckenridge, in the heart of downtown, with almost all specialties covered. For those looking for more of a rustic location seated at the base of the Rockies, Fort Collins offers small-town living within 70 miles of the state's capital. Summers are moderate, and the town is very friendly to cyclists, campers, golfers and all other forms of outdoor personalities. Winters are picturesque and offer opportunities for skiing, snowshoeing and snowmobiling. Nearby Denver hosts professional sports teams in basketball, football, baseball, hockey and more. The median home price in 2012 is about $220,000. Income tax is about 5 percent of federal taxable income. Access to medical care is easy through Poudre Valley Hospital, which ties in to the University of Colorado health system. This means access to all critical care, surgical care and outpatient facilities are located either right in Fort Collins or nearby in Denver. Mark Hoerrner is a writer and editor with more than 15 years of professional experience. His work has appeared in newspapers, magazines, textbooks and online publications, covering business, technology, civil/criminal investigation and international culture. What Is Meant by a Self-Contained Retirement Community? What Is the Cheapest State for a Retired Couple to Live In? What Is Taxable in California?